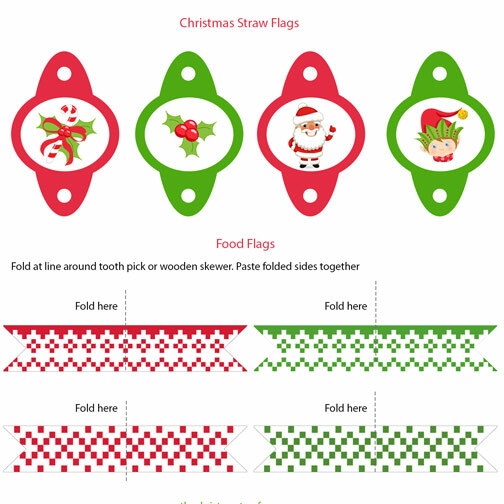 Today we have some Christmas Food Flags to match the Napkin Rings and Place Cards we posted in the last two days. Now you have a whole set to decorate your Christmas table. Click on the image above to go the the sheet of Food Flags to print out. What food do you have for Christmas Dinner? Is it a traditional Turkey Roast? In Australia, because it’s hot at this time of year, families often have different kinds of food. They sometimes have BBQ’s, cold meats and salads or seafood for the main meal. For desert Pavlova, fruit salads, ice-cream and even frozen Christmas Pudding are eaten.It’s common for us to eat outside. Pavlova has a crispy meringue base filled with cream and fruit. Another recipe from Australia is “White Christmas”, made from raisins, cherries, desiccated coconut, icing sugar, rice bubbles and coconut oil. Today’s video is a funny Australian version of Deck the Halls. It talks of BBQ’s and eating outside.